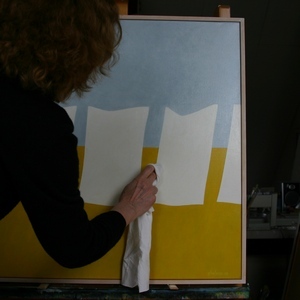 I graduated in 1967 from the AKI in Enschede (the Netherlands), department of Painting and Monumental Design. The last year of the Academy I found my own form of expression. My free work was small in size. My materials were tempera on paper, pen and watercolour. The form was clear and simple. After my artistic education I was one of the first inhabitants of the "Emmanuelshuizen" a collectivity of artists in Zwolle. This group of about ten people carried out various exhibitions in the Netherlands. I also took part in "wandering" exhibitions of "de Nederlandse Kunststichting". Until 1986 I made monumental wallpaintings and decorations for schools and other buildings, commissioned by the municipality of Enschede and private persons, in Hengelo and Zwolle. In my free work I replaced tempera and paper by acrylic paint and canvas. The formats became larger. My early work was mostly abstract, but already shapes emerged that could be interpreted as houses and barns. Abstractions gradually became landscapes. My work is composed of many thin layers of paint in order to achieve an intense and lively tone and color. After a quiet period I have exhibitions again since 2000. I participated in group exhibitions on various locations in the province of Overijssel and in the "Waterschapsgebouw Velt and Vecht" in Coevorden. I had solo exhibitions at Lonneker and Enschede and a retrospective exhibition in museum "Nieuwland" in Lelystad. In 2013 I exhibited in Ostfriesland (Germany) in the framework of of a cultural year of the region. In 2014 my work was shown in "Museum het Palthehuis" in Oldenzaal. I ilustrated poems of the Dutch poet Willem Wilmink (Click here). Commissioned by individuals I make paintings of private houses. My work is procured by the Dutch state, the municipalities and private persons. In 2010 a book was published about my work, created by Martin van Laar and Brandie Oosterwold.